Manchester Airport advertising with Transport Media gives you the opportunity to target millions of passengers in the busiest UK airport outside of London. At Transport Media we work with a range of advertising formats and media solutions to plan and deliver campaigns of the highest calibre. By advertising in Manchester Airport, your brand can gain coverage in front of millions of business flyers and tourists from the UK and the rest of the world. Manchester Airport is the UK’s third busiest airport, and handles over two million passengers each month. Advertising in Manchester Airport UK can offer your business exposure in front of millions of flyers from across Britain as well as the rest of the world. As the major international gateway in the north of England, advertise in Manchester Airport for the chance to make an impression both domestically and globally. Advertise in Manchester Airport with Transport Media to reach your perfect audience, regardless of your target demographic or industry. We work with a range of formats and are able to position your ads in specific terminals, gates or lounges – allowing you to reach your ideal audience and make a big impression as they arrive or depart from the country. 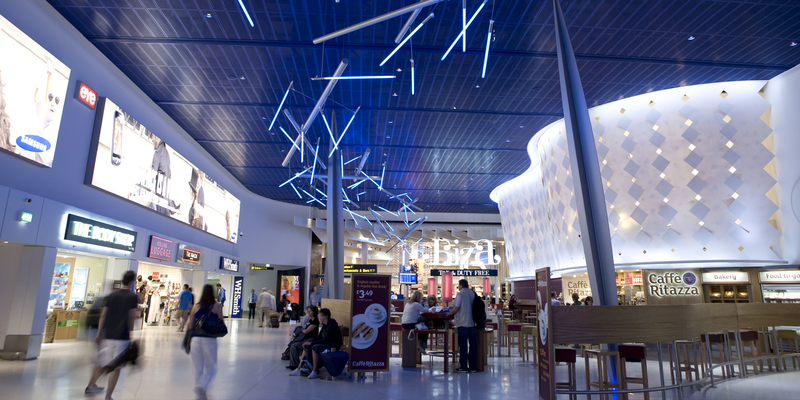 With a range of shops, bars and restaurants located inside its terminal buildings, Manchester Airport shopping advertising is a great way to influence instant purchases on an audience with time to kill and money to spend. As one of the country’s major business-orientated cities, advertise in Manchester Airport in order to target powerful executives, business people and decision makers who hold high influence and purchasing power. Known as the ‘capital of the North,’ Manchester is one of the UK’s most visited cities as both a business and tourist destination. It continues to develop, and has one of the strongest economies in the country. Its growing status can be seen through the relocation of BBC, ITV and several other media companies to the city from previous bases in London. Advertising in Manchester Airport is a fantastic way to reach an influential audience of business people and those in the media industries, as well as tourists. Manchester has several major tourist attractions and is home to one of the world’s most famous and successful football clubs, Manchester United, who have huge global appeal and attract visitors from around the world. Manchester Airport advertising from Transport Media can offer your brand exposure on a huge scale across a range of exciting and innovative advertising formats. With years of experience in planning and delivering campaigns in some of the world’s major international airports for a number of high profile clients, Transport Media is your number one choice if you’re looking to advertise in Manchester Airport. Get in touch today to find out more, via telephone or online contact form.